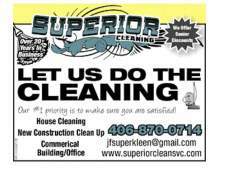 Superior Cleaning Service is a locally-owned cleaning company serving clients for 25 years in and around the Great Falls area with thorough and attentive work. Our professional staff works hard to keep your home, office, or hotel in tip top shape. We also offer new construction cleanup for the whole state of Montana. Contact us today for more information!